My husband is a huge fan of carrot cake. I have already made some carrot cake larabars and also a carrot cake baked oatmeal, but I decided to try some Frosted Carrot Cake Bars. I don’t even like carrot cake, but I thought these came out really good! They are so easy to make too. No cooking required! 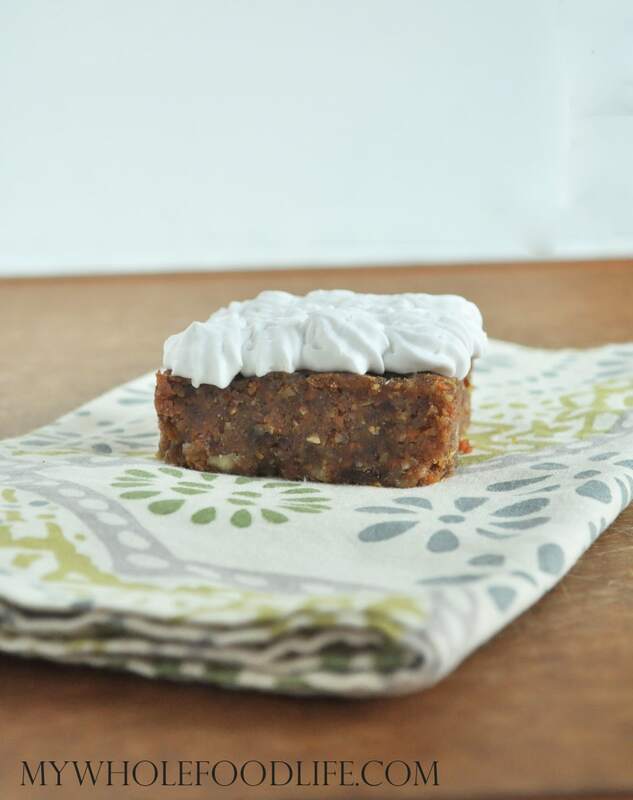 These frosted carrot cake bars are vegan, gluten free and paleo. They only take a few minutes to whip up. If you are a visual person, I created a video on how to make the frosting. In a food processor , combine all the ingredients for the bars. About 1 to 2 minutes. If the mixture looks a little dry, you can add a little water. Spoon batter into the pan and place the bars in the fridge. Open the can of coconut and scoop the fatty white part into a mixing bowl with the maple syrup. Save the water that is left for smoothies. Using a whipping attachment on your mixer , whip into a cream consistency. This may take a minute or two. Spoon the cream into a pastry bag and pipe the frosting on. Use a pizza cutter to cut into bars. Enjoy! can you substitute something for The dried pineapple? I'm not a big carrot cake person, either, but my hubby loves it, too. These do look good, though, and I love the video! Can I replace the coconut milk with something else? So this is pretty much a lara bar. We don't like pineapple, can we leave it out? I LOVE carrot cake. My best friend and I used to travel around the city trying to find the best carrot cake. In the last few years, I have had to give up refined sugars and flours. I am so happy to find this recipe. 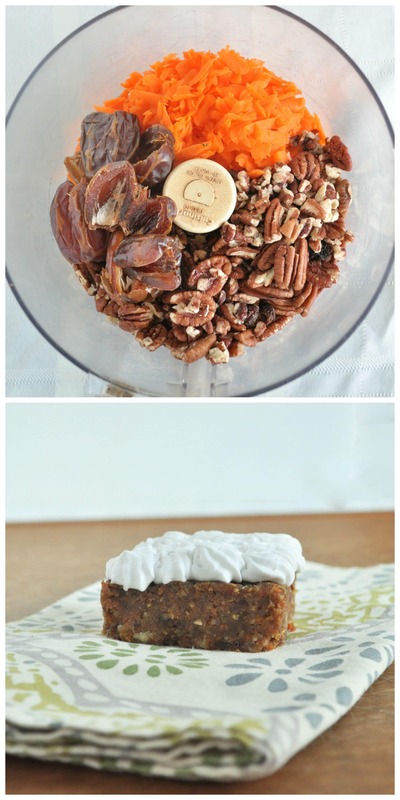 It seems like a relatively simple recipe to follow, it's healthy and it will conquer my constant need for carrot cake. Thanks for this recipe! You are welcome Nicole! I hope you enjoy it. These look so yummy!!!!!!!!! I really need to get some dried pineapple so I can try them!!!! What could one replace the pecans with? I cannot do nuts. I'll try some ground sunflower seeds, and maybe some coconut flour? Has anyone else had success with this?